If you are planning to hold an event, then you should know how important it is that you are able to prepare everything that it needs and know exactly what needs to be done to pull it off successfully. That’s why most organizers make use of checklist samples. This article will teach you all that you need to know in order to properly make one. Before you can begin making a checklist, you will need to understand the event that you are going to hold. What kind of event is it going to be? Who is it meant for? What kind of programs or activities will take part in it? These are the kinds of questions that you will need to answer to know what you should put in your checklist. These are the things that you will be working towards throughout the entire event planning and organizing process. Figuring out what these are should help you identify all of the tasks that need to be completed as well as the resources that will help ensure the event is a success. Make sure to provide short descriptions of these goals and objectives into the checklist. Next is for you to put in the different dates that are involved during the entire event-making process. Think of it as similar to making an event schedule wherein you will need to point out when exactly something has to be acquired or when a task has to be started and finished. It’s best to be specific with when writing down dates, meaning that you will want to put in the month, day, and year for certain items on the list. This is one of the things that you should prioritize in your checklist. You won’t be able to have an event if there is no place to hold it. You need to consider the different factors that can affect the venue that needs to be chosen. This would include the number of people that will attend and the programs which will take place. Put tasks such as talking with the property owner and securing lease payment in your checklist. Next is for you to think about the names of those that will be hosting or holding programs during your event. These would be people that can help promote your event and attract potential attendees into actually participating. Consider how you are going to set up agreements with these people and include any related tasks in your checklist. Lastly, you will need to understand who will be selling what in your event, as well as what will take place. It is important to set up deals with vendors and figure out what kind of activities/programs the event shall have as soon as possible. Once you have figured it all out, put the list of tasks that you need to do in order to acquire and plan them into your checklist. 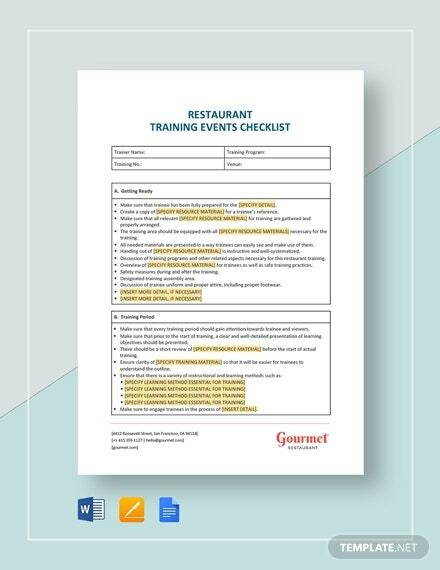 Let’s say that a particular restaurant wishes to hold an event which involves training employees and staff in regards to their roles. If you are going to hold such an event, then you will find that this particular template will no doubt be very useful during the organization process. 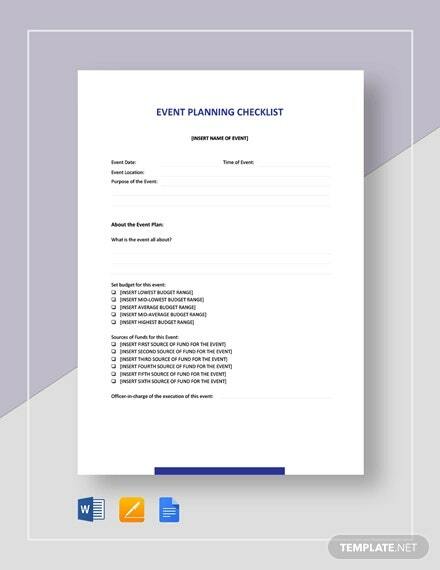 If you are going to make sure that the event you are going to hold ends up becoming a success, then you will find that this particular checklist template will definitely come in handy. Use it so that you may have an easier time knowing what it is that you need and what needs to be done to ensure the event successfully start and ends. 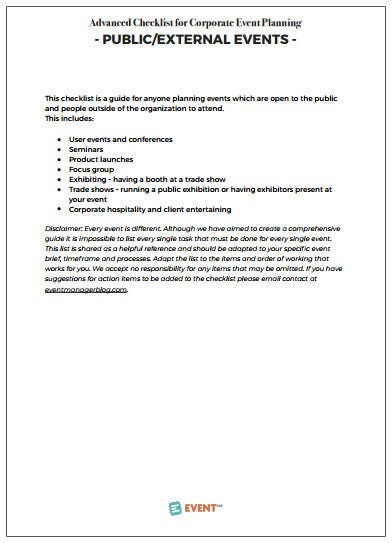 Take note that should you decide to hold an event, then a template such as this is something that you’ll want to download and use. Be sure to use programs such as Microsoft Word, Publisher, or Apple Pages to open and customize the template until you can make the document you need. 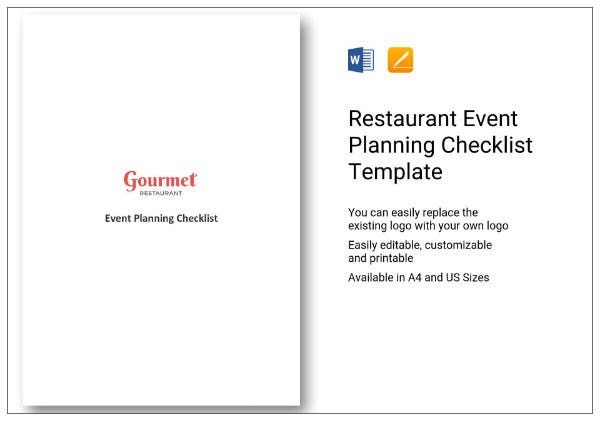 If you wish to hold an event in a particular restaurant, then you should know that there are a ton of tasks you will need to complete in order to do so. 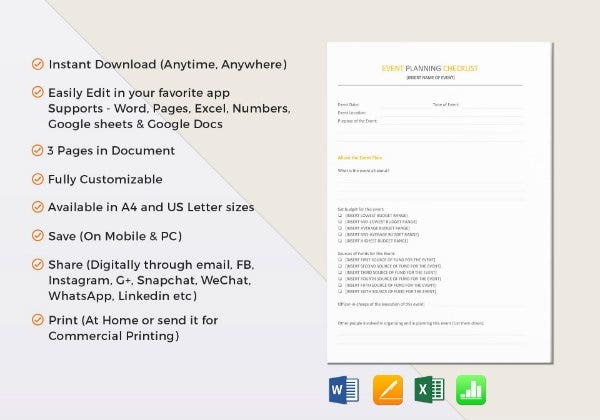 In the event that you are having trouble keeping track of what needs to be done, then get this template to make a document that will surely help you out. 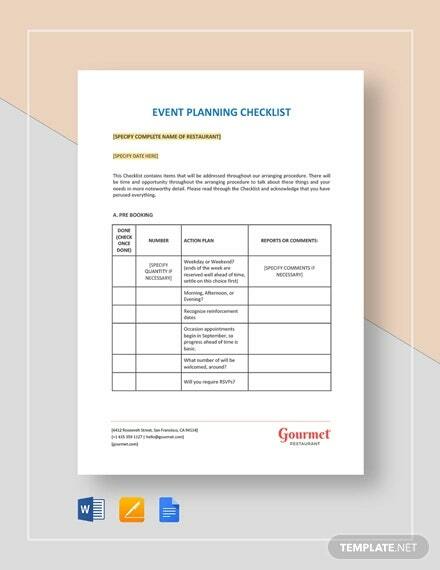 If you are looking for a template that will help you make an event checklist for free, then get the one that’s available right here. 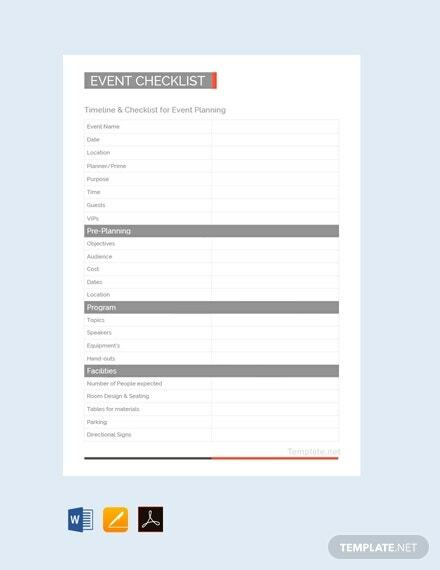 Even if it’s free, there’s no doubt that it will still help you create a checklist that can help you keep track of all the things you need for an event. Even major corporations need to hold important events. So when there’s a reason to have one and you’re the person who has been given the responsibility of planning everything out, then use this template when you need to. With it, you’ll have an easy time checking what the corporate events needs, who needs to be in it, what will take place in it and so on.